Weight: 24 - 57 oz. Food: Scavenger, eats almost anything: insects, snakes, dead animals, human food scraps, eggs, & garbage. Common ravens are one of the most widespread, naturally occurring birds worldwide. The raven is a large, entirely black bird with a wedge-shaped tail. They have a well-developed ruff of feathers on the throat, which are called 'hackles' and are used often social communication. These are the largest passerines. 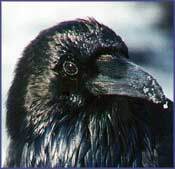 The raven call is a croaking drawling croooaaak or cur-ruk or metallic tok.. Hear It Now! Ravens are frequently a big agricultural pest bird due to their fondness for corn and other farm crops and have been accused of killing or maiming small livestock, but they are a minor urban pest compared to the pigeon, starling or house sparrow. They may also negatively affect conservation efforts aimed at desert tortoises, sandhill cranes, and California condors. These birds can overwhelm trees, creating a lot of noise and harassing people and animals in the vicinity which can be a nuisance to the suburban resident. Furthermore, like any pest bird, dropping buildup can lead to structural damage from the uric acid while also posing a health risk due to the harborage of disease. It is possible to drive away large flocks of ravens and other crows with audio and visual scare devices such as the BirdXPeller Pro or Ultrason X unit combined with visual scare devices like Bird Bopper holographic balloon and Irri-Tape iridescent foil. To maximize effectiveness, hang visual products in trees before beginning an aural campaign. They can be kept off ledges using Bird Spikes or Bird Stop biodegradable food spray. BirdNet will exclude crows completely from most areas. Shock Tape is a new deterrent method that sends a small shock to birds when they land on surfaces. Shock Stick can be used in trees to create an electrified perch to repel crows. The Industrial Bird Hazer can help keep flocks of crows out of crop fields. See our complete list below of recommended bird deterrent products to repel ravens. A "synergy" or combination of bird repellent products typically offer the most successful solution for repelling ravens. For bird control solutions, we often recommend using companion products by combining electronic repeller devices or bird hazers with visual scare deterrents, physical bird barriers or scent and taste aversion products. This kind of multi-sensory attack is extremely effective in deterring pest ravens for good! Irri-TapeFoil tape repels birds with a synergy of visual, audible and physical distractions to scare them off. Mutil-Sensory Visual Scare KitMulti-sensory visual scare kit combines three proven effective visual scare devices to repel birds. Shock StickLow voltage shock stick is hung in trees or laid across bushes to create artificial electrified perches.